I love getting snail mail and my son loves helping me check and see if we got anything good (besides junk mail) each day. We had letter writing time today... and I think I'm going to make it a weekly event. Not necessarily every Saturday, but maybe at least one day a week... if not more often? Today we wrote letters to Grandparents (hopefully get mailed... that is the hardest part for me... I have a few Thank You cards that I forgot to mail from 6 months ago). I love the idea of having some little letter writing prompts in a jar (or pocket- see cool letter area below from Craftzine) to help when kids are stumped about what to write. Today was very unstructured and my little guy just got to write what he wanted. The components that helped him be interested in this activity were a variety of cool stickers, different sized and colored papers, alphabet stamps and stickers, a variety of writing tools, envelopes, and a play mailbox. I sat down with him and we got started together. He did some "writing" with abc stamps, abc stickers, pencils, and markers. After awhile, he had to take a detour from writing and create a giant volcano. Then we talked about how we mail a letter and what we need to do in order to get it from our house to someone else's house. Simple steps: stick the letter in an envelope, write a return address and a mailing address on it, add a stamp, and put it in the mailbox. I absolutely love this Family Letter Center from Craftzine. I want to make one to use during weekly letter writing time. We'll see if I can convince myself to attempt it... my last sewing project (ABC beanbags) is still unfinished! Over time I am excited to introduce the basic components of letter writing to my son. I feel like those skills are getting lost in the age of emailing, texting, and Facebook... so I want to make sure that he is exposed to them. 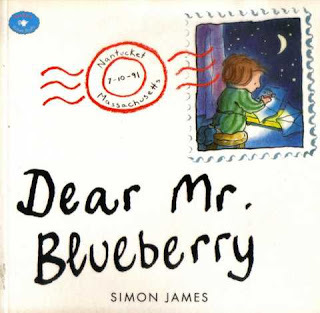 Dr. Mr. Blueberry by Simon James was one of my favorite books to use with my first and second graders when we did letter writing... but it is simple enough for my 3-year-old to love as well. Emily writes letter to her teacher, Mr. Blueberry, about a whale that she thinks lives in the pond in her yard. The story is charming and so are the illustrations. 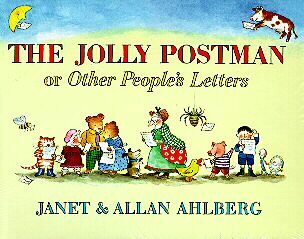 I also love The Jolly Postman by Janet and Allan Ahlberg. This book has little envelopes and letters on each page that kids can take out and manipulate. The Jolly Postman delivers letters to many of the characters in fairytale land- the Three Bears, Hansel and Gretel, etc.) It is a positively adorable book! Do you have any other favorite letter writing themed books? What are some other ways to expose kids to letter writing? Just today I was thinking about making a monthly letter-writing evening with my little boys. I do love getting thoughtful mail and hope the art of letter-writing never entirely dies. One story I like is The Giant Hug by Sandra Horning. It conveys the "feeling" we put in a letter, but also shows how our mail travels to and from where it's going in a cute way. Michelle thanks for the book suggestion! We will have to check it out. Great idea! Fun to make, and the people who receive the letters are going to love them too!